Address : Jalan Gereja, Tanah Rata,39000,Cameron Highlands Pahang. 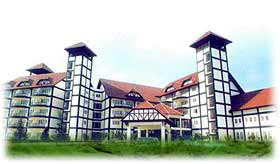 Heritage Hotel Cameron Highlands is a 165 room tudor styled boutique hotel nestled on top of a hill at Tanah Rata. It is a haven of warmth and friendly staff which offer very personalized service. The hotel offers a range of convenience, spacious and comfortable accommodation. The hotel ideally located at 1,500m above sea level surrounded by lush tropical forest which gives a bird's eye view of the panoramic town of Tanah Rata. Its eye-catching tudor styled architecture, elegantly sculpture garden provide an ambience of an English sculpture countryside.